This is an Andhra style Adai dosai that is made specially with moong dal. Wash and soak the dal and rice for about 2 hours. Grind it along with the other ingredients to a fine batter. 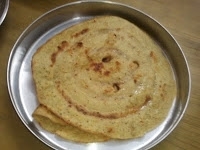 Heat a tawa and pour the batter just like dosa and spread it evenly. When one side is crisp, turn it to the other side. Cook for about a minute. Transfer to a serving plate and serve with mint chutney, sweet mango pickle, mor kuzhambu or honey.